At a time when governments are being forced to make savings in public expenditure, why should they continue to invest public money funding research into ancient Greek tragedy, literary value, philosophical conundrums or the aesthetics of design? Does such research deliver ‘value for money’ and ‘public benefit’? Dave O’Brien finds Jonathan Bate’s recent thought-provoking collection to be essential reading for public, policy-maker, practitioner and academic alike. The Public Value of the Humanities. Jonathan Bate. Bloomsbury Academic. January 2011. Debates around the future of the arts and humanities are currently the essential talking point both within academia and in wider media discussions. From the question of how best to deliver cultural education as part of the broader creative ecology in the UK, to recent controversy over the choice of language by the Arts and Humanities Research Council (and much else in between), arts and humanities within the UK seem to be at a crucial point in their history. It is very welcome, therefore, to read a wonderful edited collection on The Public Value of the Humanities, which presents an informative, thought-provoking and ultimately robust defence of humanities research. The book is essential reading for public, policy-maker, practitioner and academic alike and should contribute to moving discussions beyond the rather clichéd assumptions surrounding much contemporary discourse over public funding for humanities research. However, as superb a collection as the book is, there are limitations to its ability to influence contemporary debates based on the lack of engagement with the broader question of the role of the university and its introduction’s hostility towards the impact agenda. The book contains 24 essays on a range of humanities subjects. The essays are as varied as the humanities, including (but not limited to) Genocide studies, linguistics, ancient and modern languages, philosophy, literature, rhetoric, music, visual arts and film. The book provides an excellent overview of contemporary humanities research, its breadth giving an obvious insight into the vast array of subjects and styles present within the humanities. It is also very clearly a book of its time, attempting to redress the balance away from the emphasis on STEM subjects in government discourses with case studies from contemporary humanities research. 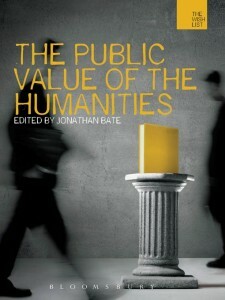 Most of the essays make the case for the public value of humanities in terms of their ability to answer the question identified by Bate’s introductory essay, the question of ‘what is value?’ Each essay touches on this in a different way, offering discussions of economic value, the importance of research to national, local and individual identity, the impact of research for practitioners, policy makers, the public or businesses and the way humanities research shapes the environment in which we experience our everyday life. It would be unfair (and ill-judged) to summarise each essay, but it is worth commenting on three that engage most directly with the problem of economic value, given the importance of economic ideas in public policy making. Mike Parker Pearson makes (in a wide ranging discussion) the case for the economic value of archaeology, whilst Richard Howells and Ronan McDonald attempt to deconstruct the idea of economic value. McDonald’s is, for this reviewer, the standout essay of the 24, giving a nuanced and perceptive critique of the nature of value which provided both academic application made the reviewer return to the question of what is valuable and how that value can be justified. David Edgerton has argued, elsewhere from this collection, that “Universities [produce] people and knowledge, not inventions“. This book gives a clear idea of essential importance of the humanities to this production. Katie Overy’s description of the role of music research, for example, shows how the humanities can ensure the knowledge and individuals developed within universities can be put to the best use for contemporary society. The role of the humanities in connecting organisations with their publics, alongside developing human capital within politics, business and media networks is also covered in the book, in particular discussions of Mitchell and Kenyon’s archive, which went on to be a successful BBC television series, and the way policy makers can make use of historical research. The book did have two faults, one perhaps fundamental, the other more benign. In the first instance the hostility towards the impact agenda in Bate’s introduction is rather problematic. Bate is right to question the regime of measurement, Research Excellence Framework and the replacement of intrinsic value with the skills agenda (in a similar way to critiques found in the media). However so many of the essays in the book present obviously outstanding examples of how research creates impact and give starting points for how impact maybe measured. Associated with this point is the question which is largely unanswered within the book: what is the role of the university? Aside from two contributors, the scholars writing in the book do so from within a university. As such it was surprising that there was no real engagement with questions as to the appropriateness of the three year undergraduate model, the employability agenda and the future of the many PhD students who currently face an uncertain future in the brave new world greeting the £9000 per year academy. Whilst some of the essays, in particular Mike Press’ discussion of postgrad design education, touch on this issue, the problem could have been more explicitly dealt with. Almost all of the research detailed in the collection involved the university at some stage in the process, so asking what the public value of this institution is would only have strengthened the force of the arguments presented, perhaps by including an essay that focused exclusively on how best to deliver a thriving university sector, as well as the radical alternative visions of higher education (from both sides of the ideological spectrum). In addition more from end users of humanities research, as well as more practitioner perspectives to build on those offered by Ben Cowell from the National Trust and Christopher Breward from the Victoria and Albert Museum would have given the book a less, if one might be so bold, ivory tower perspective. The other substantive criticism is much more benign, in that the sheer wealth of references, projects, ideas and possible reading suggested by the essays made it impossible to read the collection without making notes for following up or turning to the web to track down further information. This is to the credit of the authors, but does not make the reviewer’s path through the text any smoother! Those points notwithstanding (which suggest the necessity of a companion volume on the public value of the university) the book deserves to take its place amongst any lists of this year’s essential reading. This review was originally published on the British Politics and Policy at LSE Blog on 5th June 2011.